View photos, sizing and pricing for new & used rack supported warehouse cantilever racks. 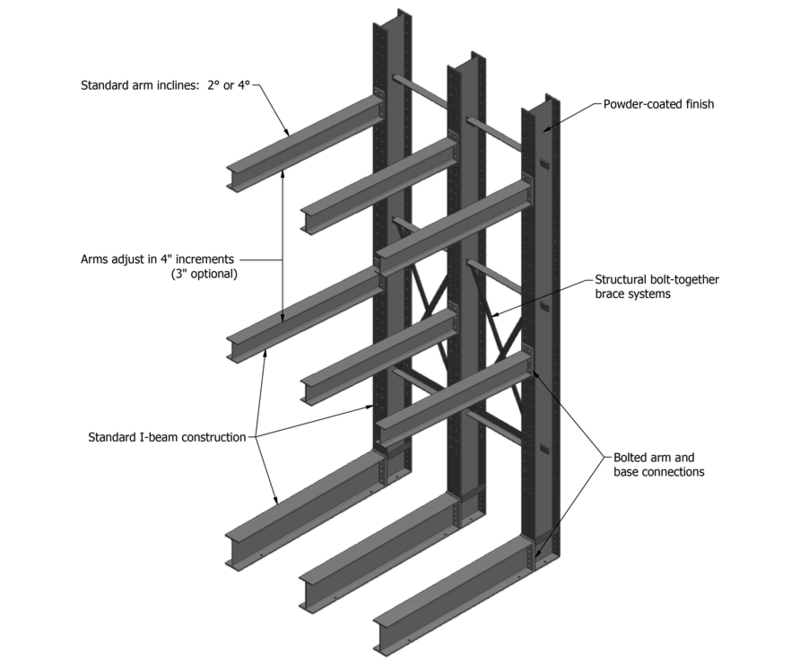 For more general information on cantilever rack, check out our Cantilever Rack Buyer's Guide. SJF's structural steel roofed building structures are designed and manufactured for select clients who are looking for a protected turnkey canopy storage system and are in need of a high-density, covered storage rack building option. These systems are typically comprised of structural steel cantilever racking, truss beams and metal roof decking. 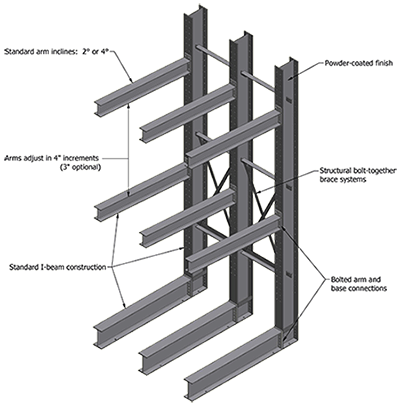 Truss widths are engineered to meet site-specific requirements and arm configurations are available with three, four or five levels of storage or more. 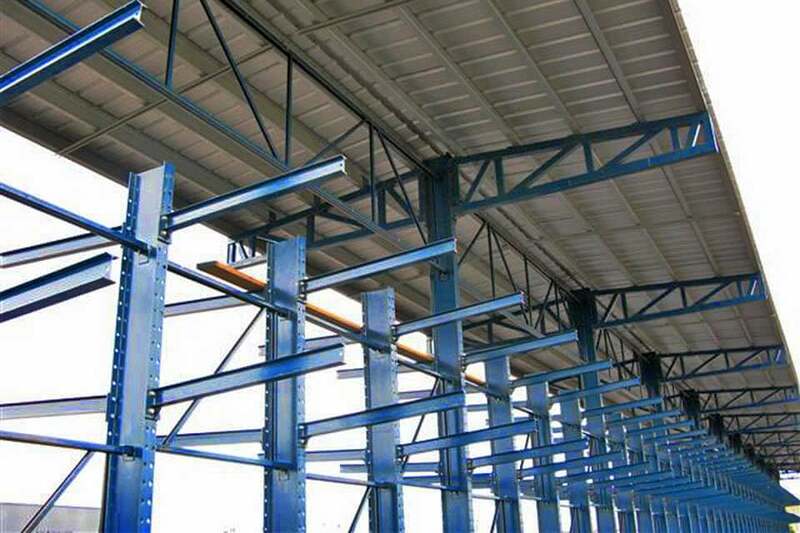 Extremely space efficient, structural steel cantilever racks allow for easy storage, handling and organization of materials while the installation of a roof reduces product damage and loss due to weather exposure. 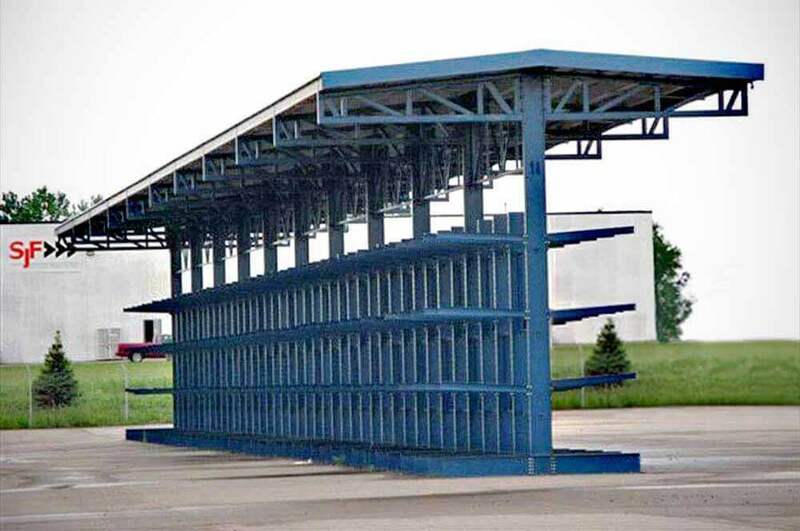 Structural cantilever building racks with roofs can easily be utilized for a wide range of products and are available in T-shed, L-shed and drive-thru configurations. 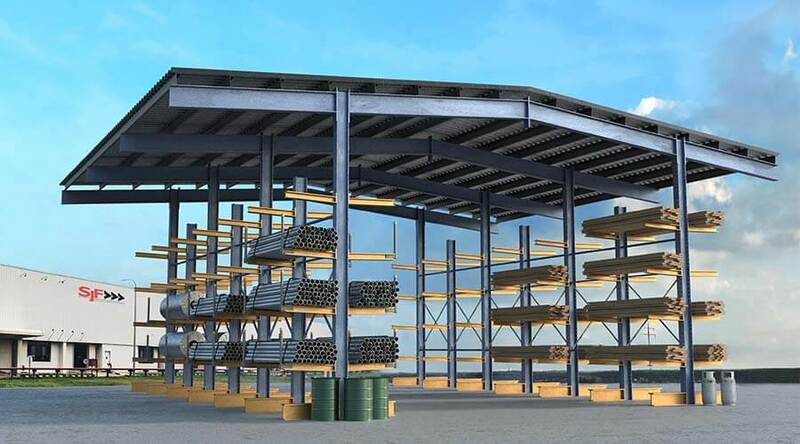 SJF's cantilever rack-supported storage buildings are engineered with American-made parts using the most stringent American Institute of Steel Construction (AISC) standards, which typically meets or exceeds Rack Manufacturer's Institute (RMI) standards. AISC standards were developed to guide the design of large steel structures such as bridges and buildings. The stringent nature of these standards assure that you can be confident that your people and products are safe and secure. All vertical and horizontal members are manufactured using wide flange beams with a 50 KSI minimum yield, offering greater strength and durability compared to roll-formed steel. As a result, our structural cantilever racks and structural foundations better resist damage from material handling equipment and provide larger load capacity within a given space. Contact us using the form below. We will assign one of our systems specialists to your project. He will contact you to discuss a rack supported storage building specifically designed for your company.